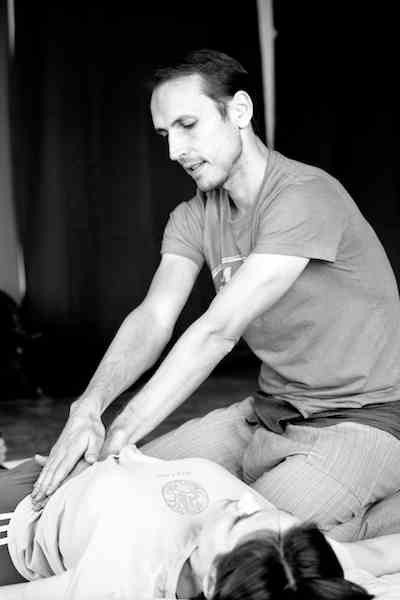 Thai MT is an advanced method of manual therapy developed and practiced by Slava Kolpakov, LMT. This work combines advanced Thai Massage, Sports Massage, Neuromuscular Therapy, and musculoskeletal manipulation. This course covers the entire lower body. Practitioners are taught detailed anatomy, and common pathologies such as Piriformis Syndrome, Achilles tendonitis, Patellofemoral pain, and many others. Multiple treatment patterns and sequences are discussed and practiced during this course. Required material: Trail Guide to the Body. In this course, participants learn to work with specific injury and tension patterns in the upper girdle, neck, jaw, and scalp. Specific anatomy is discussed. In this course, participants learn to work with the conditions of chronic tension and pain in the spine and ribcage, as well as abdominal muscle release.